Pathfinder, Drum/Percussion Sample from SoulviaSound. SoulviaSound has released Pathfinder, a post produced vinyl drum library with additional scratch banks, designed for Maschine and Battery owners. SoulviaSound bought some different unreleased radio promotion discs from the 80's - 90's, second hand vinyls sampled through a Class-A RIAA preamplifier and an 2 x API 7600 Channel Strip into Pro Tools. The kits are prepared for Maschine and Battery. 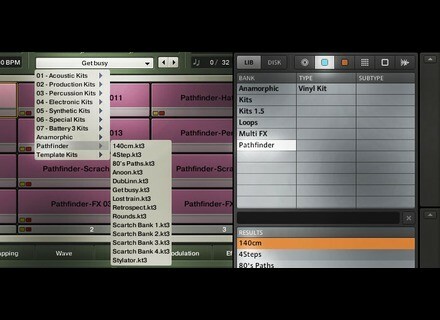 For Maschine the scratches banks are mapped for keyboard like a normal Maschine instrument. The audio demos are made with Pathfinder and REDD (only where you hear synths) into Maschine, without extra processing. 4 Scratch Banks (49 keys for every bank). You can use it for styles such as Hip Hop, Dubstep, Pop, Electro or other retro modern combinations.